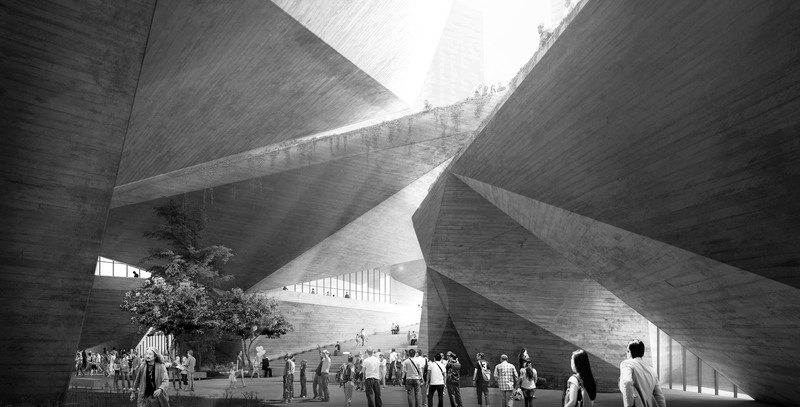 Each project is, for an architect, an opportunity to find answers to different questions. 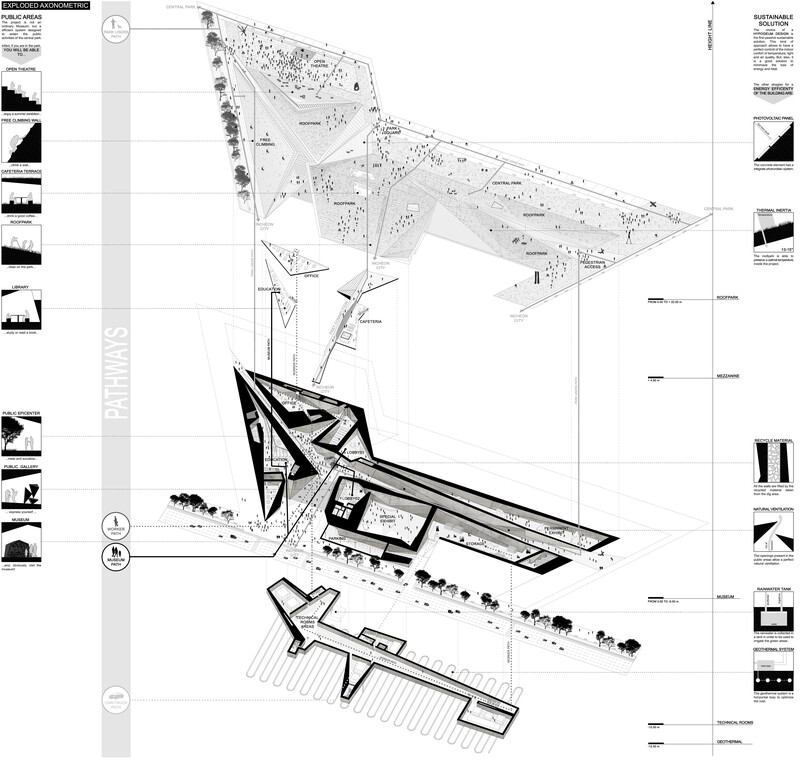 What is the relation between the typology and the context? 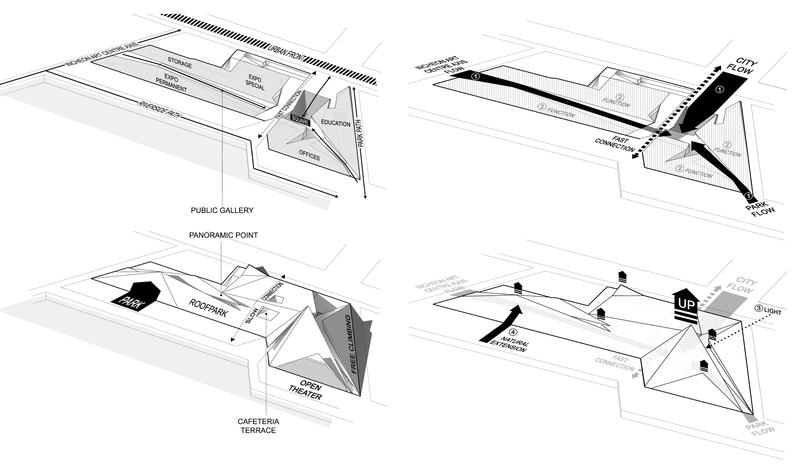 What is the possible value of a public building, as for a museum, seen as an element of mediation between the city and nature. 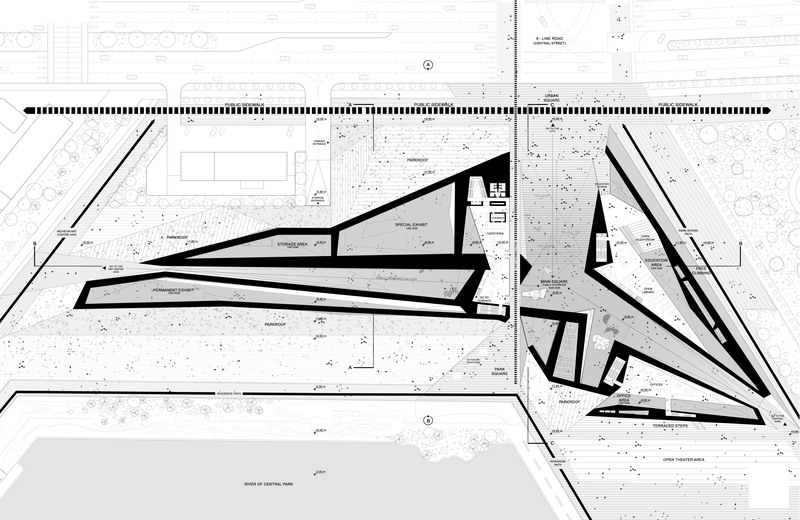 They immediately prompted the need to discard the idea of a completely elevated building, because it would represent a fracture along the boundary between the city and the park. 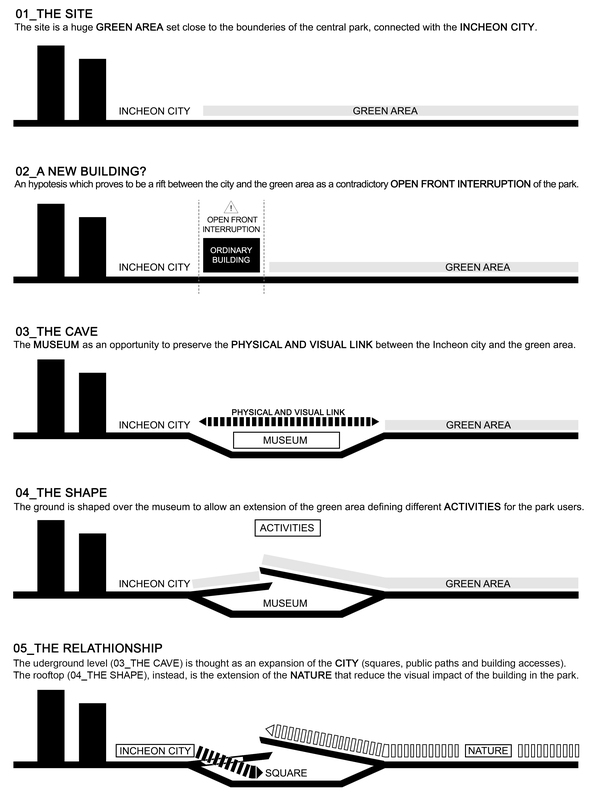 An inconsistent and isolated break of a completely open front towards the Natural area on which this part of the city opens. The need to ensure the visual and physical continuity between the city and the park, has suggested the archetype of the cave as the main evocative image, a space where the first forms of writing originated, a space that men conquered letting the light come in and molded throught their flows. A site-specific design that reminds to the ancestral and sacral atmosphere of the caves through the power of the light on the surfaces and shapes, a space in which nature and artifice blend. The design process take part from the excavation and modeling of the existing soil that, while ensuring the physical interaction between the city and the park surface, opens and shapes to allow the light and the Visitors to access and cross it. The heart of this excavation is a public space, a large square, located at the intersection of the tracks coming from both the park and the city moving towards the museum. 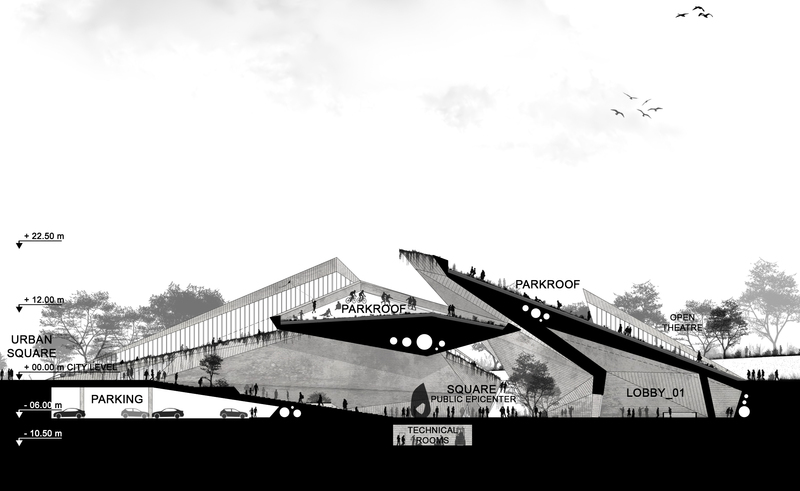 The visitors can reach it through a system of ramps, stairs and lifts from the boudaries of the project site lapped by the park’s internal pathways, such as the one coming from the subway station or the walking route, or the one located along the roadside that connects Central Park with the built-up neighborhood. Along this same axis, a pedestrian bridge overlooking the square allows to fastly cross the museum, connecting more directly the city and the park. A separate entry from that of pedestrians, allows cars and trucks to enter from the central street to the parking lot for the public and the museum’s storage, using two distinct ramps. From the museum square you can access all the functions open to the public and museum workers, such as the education area and the office and research area and the two lobbies that act as the atrium of the two exhibition spaces, the special one and the permanent one, linked by a storage space. At the level below the square there is a technical floor connectig all the functions. 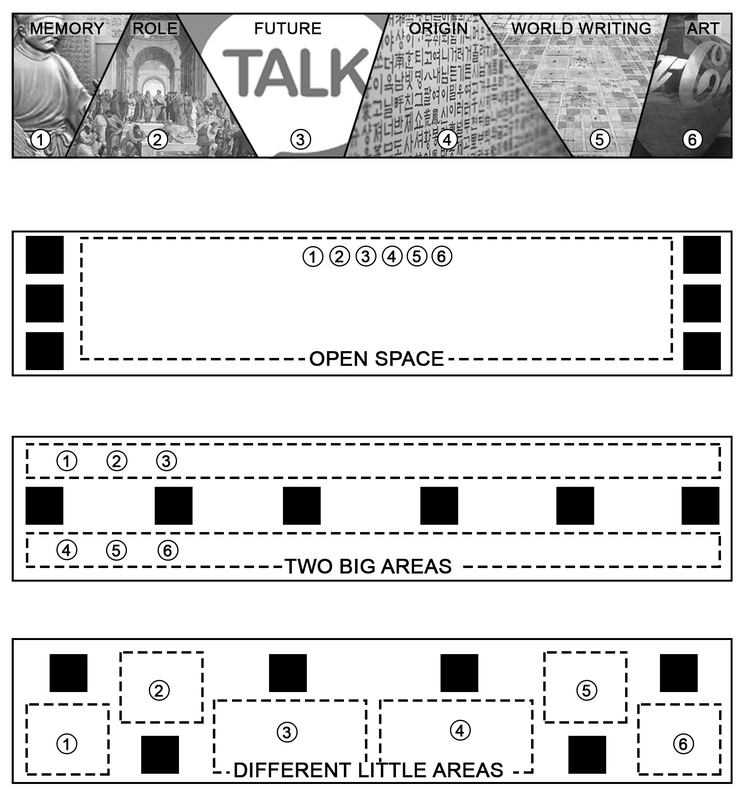 Both the Permanent and the Special Exhibition Rooms, while preserving the mentioned sacral behaviour, are designed to guarantee the maximum flexibility of use depending on the different exhibition configurations and sets, to present the six exhibit themes indicated by the competition guidelines. They are spatially articulated thanks to special mobile elements that can generate different typologies of spaces and visitors circulating paths. 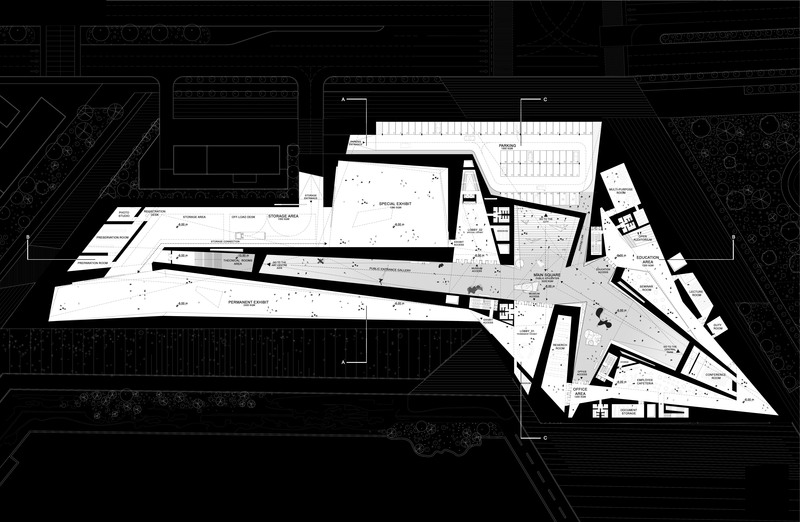 The configurations start from the simple one, with an unique open space, through the linear, counting two big areas for free circulation, and ending with the complex, characterized with multiple little areas. 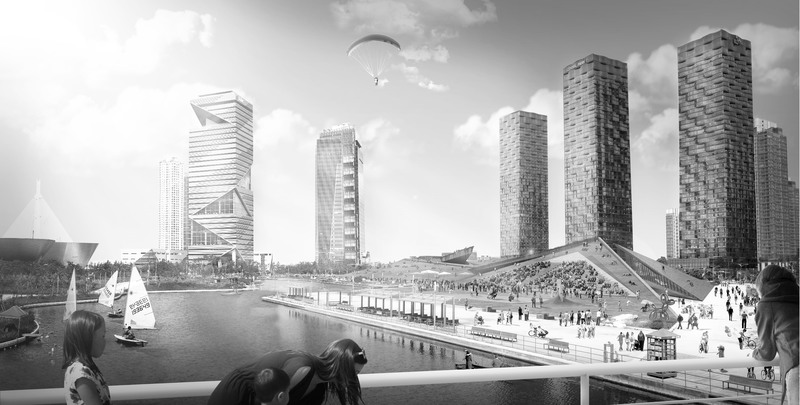 The superficial ground surface covering the museum indoor spaces is designed as a space that is offered to the city, a fifth façade for the surrounding high-rise building, a space where you can watch outdoor shows, where to play, enjoy time together, but also where just stay contemplating the surrounding landscape. The rooftop is called “roofpark” and acts as a dynamic and flexible element, where an open theater and a free climbing wall take place. The cafetteria terrace, connected to the indoor one, allows people to drink and eat together, while enjoing the dramatic view of the natural surrounding. 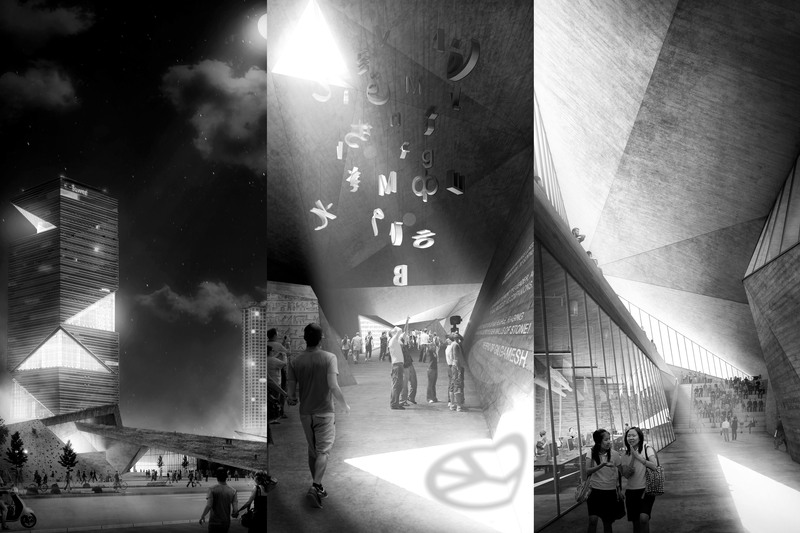 The project for the National Museum of World Writing draws a place dedicated to the exclusive use of the city inhabitants, a place with which they are called to interact, as they are called to interact with all the activities and spaces organized inside. 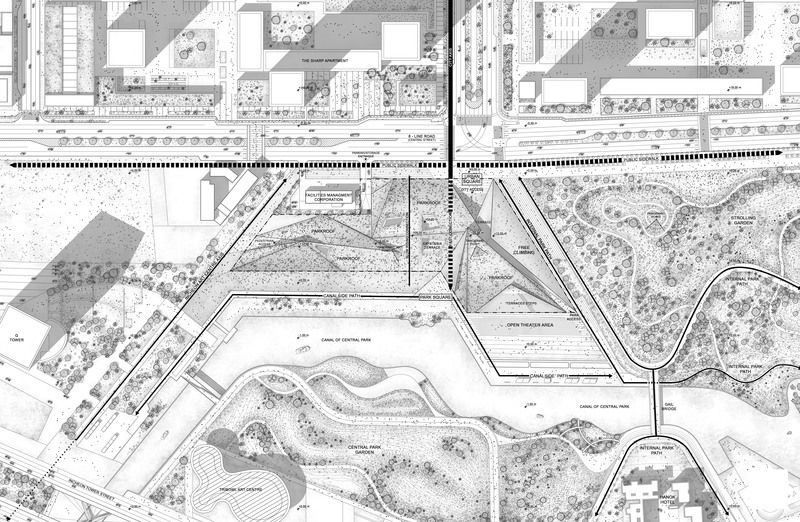 A space with to interact, an “in-between” museum among the city and the park.